Ultra-Sanitary Double-Deck Screener features gap-free screen frames, radius corners, a domed lid, washable underside, crevice-free material contact surfaces, and an Air-Lift device with quick-release "U" clamps, and complies with cGMP, 3-A, USDA and FDA requirements. MILLBURN, NJ — A new Vibroscreen® Ultra-Sanitary Double-Deck Screener from Kason Corporation for scalping, de-dusting and dewatering of contamination-sensitive materials meets cGMP, 3-A, USDA and FDA standards. The unit features gap-free screen frames, quick-release "U" clamps, radius corners, a domed lid, an "Air-Lift" device to raise the frames, continuous ground and polished welds, a gap-free and crevice-free interior and a washable underside. The external, interlocking flange configuration of the screen frame fully envelops the support ring of the screen, allowing the screen's wire mesh to extend to the interior walls of the frame. The design eliminates the gap between the screen ring and frame wall of conventional screeners, eliminating areas where material would otherwise collect. The new screener dramatically reduces the possibility of contamination due to bacteria growth, while improving sanitizing efficiency, making it suitable for pharmaceutical, food and dairy applications, as well as chemical applications where cross-contamination is a concern. material, and can be provided with a mesh-tolerance certificate. The wire mesh screening material is offered in 304, 316 and "magnetic" 400-series stainless steel that, if broken, can be captured by a downstream magnet. 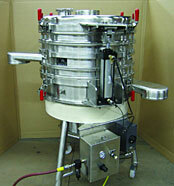 Adding to the unit's cleanliness are a domed lid, discharge spouts with radius corners, continuous weld seams and material contact surfaces polished to a sanitary finish, and a 3-post, open base with stainless steel motor enclosure allowing thorough wash down of the unit's underside and plant floor. The screener can be equipped with a Clean-In-Place (CIP) spray wash system and designed to operate under a blanket of an inert gas. The screener is also equipped with the company's Air-Lift system, allowing rapid access to the upper and lower screening chambers for cleaning, inspection and/or screen changes. The U-shaped quick-disconnect vertical clamps are lockable and allow disengagement of upper and lower screen frame sections significantly faster than with conventional band clamps, reducing downtime and allowing one operator to perform what was previously a two-person task, depending on screen diameter. Controls are housed in a lockable panel and can interface with existing PLCs for remote control.